In this topic, we teach basic Qt knowledge by implementing a simple Notepad application using C++ and the Qt Widgets module. The application is a small text editor which allows you to create a text file, save it, print it, or reopen and edit it again. You can also set the font to be used. You can find the final Notepad source files in the qtdoc repository in the tutorials/notepad directory. 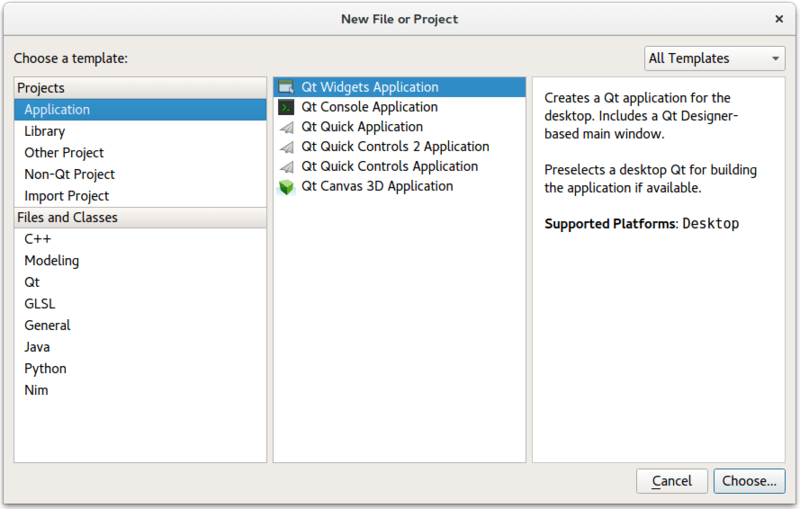 You can either fetch the Qt 5 sources from Qt Project or install them as part of Qt 5. 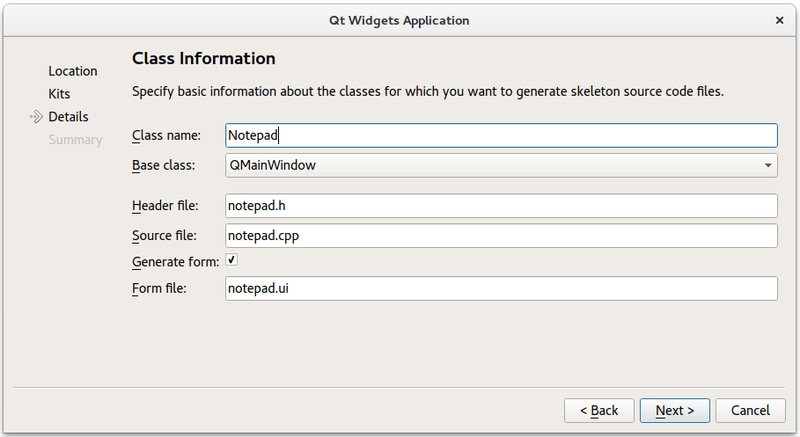 The application is also available in the example list of Qt Creator's Welcome mode. We will go through the code line by line. The following lines include the header files for the Notepad widget and QApplication. All Qt classes have a header file named after them. 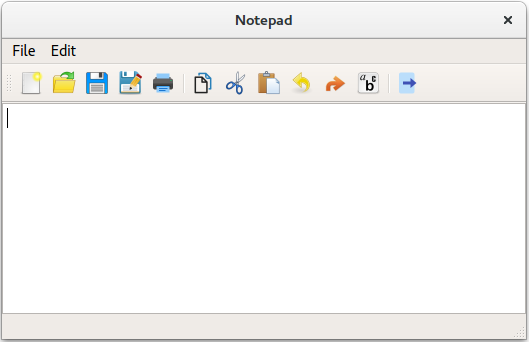 The following line shows the Notepad widget on the screen in its own window. Widgets can also function as containers. An example of this is QMainWindow which often contains several types of widgets. Widgets are not visible by default; the function show() makes the widget visible. The wizard generates a user interface definition in XML format: notepad.ui. 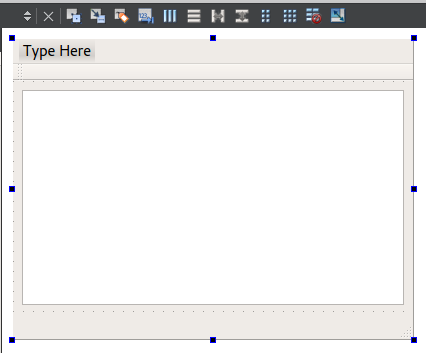 When you open the notepad.ui file in Qt Creator, it automatically opens in the integrated Qt Designer. The wizard creates an application that uses a QMainWindow. It has its own layout to which you can add a menu bar, dock widgets, toolbars, and a status bar. The center area can be occupied by any kind of widget. The wizard places the Notepad widget there. Drag and drop widgets Text Edit (QTextEdit) to the form. The class declaration contains the Q_OBJECT macro. It must come first in the class definition, and declares our class as a QObject. Naturally, it must also inherit from QObject. A QObject adds several abilities to a normal C++ class. Notably, the class name and slot names can be queried at runtime. It is also possible to query a slot's parameter types and invoke it. // If we don't have a filename from before, get one. In order to have the text edit field occupy the whole screen, we add setCentralWidget to the main window. To add functionality to the editor, we start by adding menu items and buttons on a toolbar. Click on "Type Here", and add the options New, Open, Save, Save as, Print and Exit. This creates 5 lines in the Action Editor below. To connect the actions to slots, right-click an action and select Go to slot > triggered(), and complete the code for that given slot. If we also want to add the actions to a toolbar, we can assign an icon to each QAction, and then drag the QAction to the toolbar. You assign an icon by entering an icon name in the Icon property of the action concerned. When the QAction has been dragged to the toolbar, clicking the icon will launch the associated slot. clear() clears the text buffer. QFileDialog::getOpenFileName opens a dialog enabling you to select a file. QFile object myfile has the selected file_name as parameter. We store the selected file also into the global variable current_file for later purposes. We open the file with file.open as a readonly text file. If it cannot be opened, a warning is issued, and the program stops. We define a QTextStream instream for parameter myfile. The contents of file myfile is copied into QString text. setText(text) fille the buffer of our editor with text. We create the method for saving a file in the same way as for Opening a file, by right clicking on actionSave, and selecting Go to Slot. QFile object myfile is linked to global variable current_file, the variable that contains the file we were working with. If we cannot open myfile, an error message is issued and the method stops. We create a QTextStream outstream. The contents of the editor buffer is converted to plain text, and then written to outstream. This is the same procedure as for Saving a file, the only difference being that here you need to enter a new file name for the file to be created. We declare a QPrinter object called printer. We launch a printer dialog box and store the selected printer in object printer. If we clicked on Cancel and did not select a printer, the methods returns. The actual printer command is given with ui->textEdit->print with our QPrinter object as parameter. We declare a boolean indicating if we did select a font with QFontDialog. If so, we set the font with ui->textEdit->setFont(myfont). If you select some text, and want to copy it to the clipboard, you call the appropriate method of ui->textEdit. The same counts for cut, paste, undo, and redo. This table shows the method name to use.